Richard Sandoval at work in the kitchen. As a kid growing up in Mexico City, restaurateur Richard Sandoval was knee-deep in Latin food every weekend, when his grandmother and extended family would gather for elaborate multi-course meals. 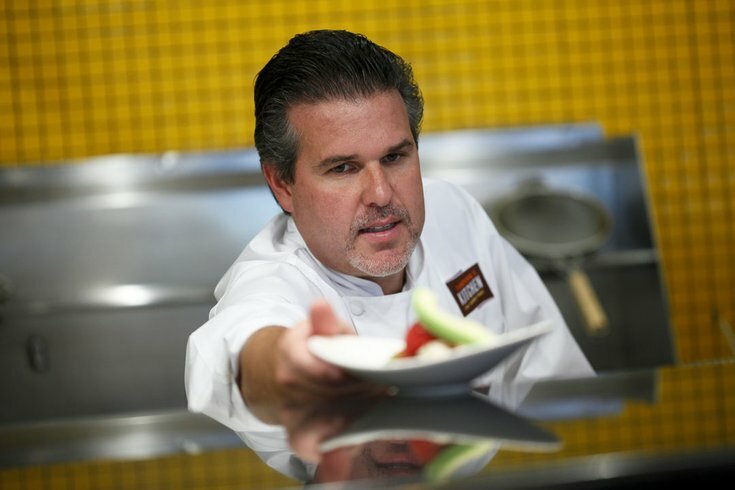 Later in life, fondly recalling those memories and in search of a career change (he was once a touring tennis athlete), he enrolled in the Culinary Institute of America and got his hands dirty at his dad’s restaurant in Mexico for five years, before ultimately opening a string of restaurants in New York in the ’90s. In June, after a decade of being nudged by big-leaguers like Stephen Starr and Jose Garces to set up camp in Philadelphia, Sandoval launched his first Philadelphia restaurant, the Latin-seafood concept Aqimero — previously 10 Arts at the Ritz-Carlton. Here, Sandoval talks heat, traveling the globe and what restaurant of his nearly four dozen is his favorite. It's very hard, and it actually causes me a lot of anxiety when I stop and think about it. Because when you look, 47 restaurants [around the world], stop and think about it: That’s a ton of restaurants and they’re around the world — it’s not like they’re in New York, D.C. and Philadelphia. These are 15 flight trips away. So I try not to think too much about it. When people say 47, I try not to focus on the number. Do you have favorites among your restaurants? Yeah, obviously I’m attached to my one in New York. It's a restaurant I opened 20 years ago. [Aqimero], it’s a spectacular room. I think it’s an iconic space. I don't think, other than Italy, you’ll find a place with these high ceilings and the marble; this is one of my favorites right now. And this is a new concept for me, a new restaurant. I like the way the menu flows and the sustainable seafood and the grill right in front of the people. It’s nice. 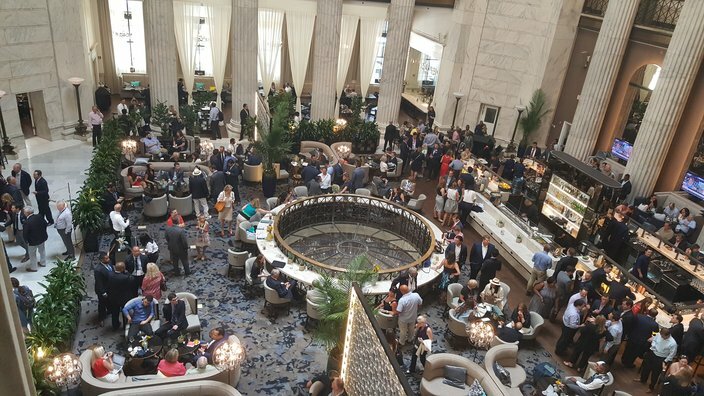 A bird's-eye view of Aqimero at the Ritz-Carlton during the DNC. The newly renovated space is stripped of a wine cellar that previously overwhelmed the center of the space. I like very simple food. So when I’m home — I built a nice kitchen outdoors, and I like to grill. And when I’m traveling a lot through my restaurants, I'm working with food, so we’re always tasting chilis and herbs and spices. When I’m home, I like very simple — olive oil, salt and pepper, maybe some herbs. I think my palate seems to be oversaturated with flavors when I’m [working] throughout the week. When I go home, I go for simple grilling. Is there such a thing as too spicy? If you're going to use the actual chili, you might just use a quarter — blend it into what you’re using to have the accent. I really love spicy food, but I think my level of heat is very different from what your palate can probably take. I’ve been eating it since I was a young kid in Mexico. My tolerance is probably much higher and it doesn’t kill my taste buds. But if you ate a teaspoon of habanero in your dish, your mouth would be on fire. But my mouth takes it. What's the reception of your food in Tokyo? It’s very good. I think the one I was most surprised by was Serbia. Serbia is Eastern European food — very bland, and there are a lot of cold winters, and it’s very straightforward and simple. So when we opened TORO, using a lot of heat, spices and avocados and cilantro, they had never seen — I didn't know how they’d take it. It’s the No. 1 restaurant in Serbia today. That market surprised me. Tokyo didn’t surprise me as much, because when you have sushi, you have wasabi and taste the spiciness and the soy sauce, so they’re used to a heavier flavor profile. They took it really well. That didn’t surprise me. But people have much more access. If I wanted to open in Japan 20 years ago, it would be much more challenging. Because people are probably not going to have as much access to information. But now, globalization, they have more access. They research you, they understand it, they read about it. It makes it easier to put their arms around it.